Research into how to improve methods of education in recent years has yielded drastic results that are changing how instructors and learners interact and approach learning. One such development is the rise of collaborative learning, which has been heralded as the future of education. For many educators, however, the rise of eLearning has made introducing collaborative elements into learning experiences difficult. 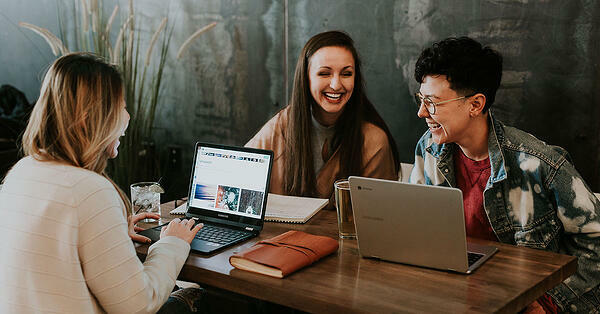 This article will show you everything you need to know to successfully incorporate collaborative learning elements into eLearning experiences. Since involving collaborative learning in classrooms on the part of educators involves a philosophical approach to teaching and not any specific set of guidelines, any learning program can feature collaborative learning. The trick is knowing how you can get learners to engage with each other, rather than relying on educators. Make informal discussions a part of the learning environment. In the eLearning space, this can be done through online forums, which a Learning Management System (LMS) such as Moodle or Totara Learn offers. Create structured group activities in which learners must collaborate in order to succeed. As an educator, your role in a collaborative learning environment is to provide students with the tools they need to be successful. Give them the information they need and then create activities that require them to use that information with one another to succeed. Combine the two above points into unique assignments. For example, separate learners into groups. Create a rotation in which one group posts a subject matter-related question on an LMS forum every week that the other groups must collaboratively answer, and rotate the askers every week. Setting up guidelines for online conversations is important. By giving learners incentives - whether they be gamification badges or extra credit - you can encourage consistent participation in online discussions. Wean off these incentives as the education experience continues, and you might be surprised by just how much students will still use your eLearning platform to chat and collaborate. You'll want to set up guidelines that prohibit the use of offensive language and imagery in your chat rooms. For a fun exercise, try appointing a different learner each week to "moderate" group discussions and act as a mediator in online debates. Listen to your learners! Create a forum where you can consistently update learners on course requirements, scheduling and assignments. Then, open up the comments and allow your students to give you feedback. If you're an academic educator, also consider setting up a forum for the parents of students to give you feedback. Creating such feedback loops is vital to the collaborative learning experience, as it allows eLearning experiences to naturally evolve in a way that best suits all involved parties. The research showing that learners often learn more from each other than they do from educators is extensive and conclusive. It's no small secret as to why, either. To give an academic example, most students would much rather discuss Beowulf with their friend than with their English teacher. By creating collaborative learning experiences, you can also positively drive learner engagement in course material. It's important to create spaces where learners can grow, both as people and as students. To this end, it can be fun to assign your learners’ various live projects throughout the course of a learning experience - for academic educators, this may be a series of group powerpoints, for business educators, this may be a series of group training exercises. Then, have other learners grade the presenting or training group. Setting up such arrangements not only allows the grading students and trainees to learn by proxy but also enables students and trainees to give each other valuable collaborative feedback that helps them evolve as learners. For more eLearning resources, watch our on-demand webinar on: How to Create Engaging and Effective eLearning.